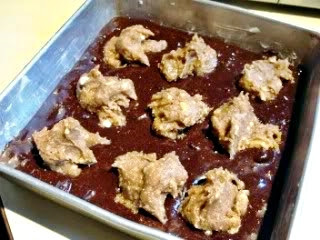 I was going to go make these right now, but I don't have enough cocoa powder. How did I let myself get so low on a staple like cocoa powder? Oh well, soon. They look wonderful! definitely a favorite combo of mine. I made it to the store and got to make these today. Oh so yummy! I'll be making them again I'm sure. I'm so glad you enjoyed them, Alicia! Wow, those look amazing! PB and chocolate is the absolute best flavor combo! I made these yesterday. This is hands down the *best* vegan brownie recipe I have ever tried, and I have tried many the last few years. 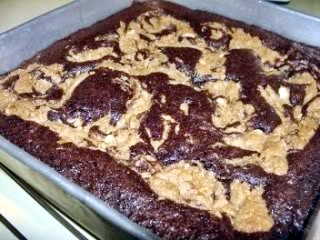 These actually taste like brownies, other recipes I have tried either turn out like cake or like fudge. Will definitely be making these again! Thank you so much for sharing your recipes! Maybe my peanut butter was too thick or something, but the mixture wasn't creamy, it was crumbly. 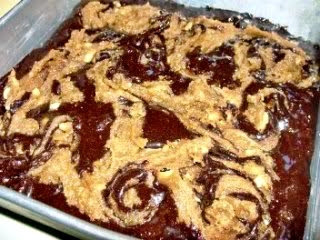 So I just sprinked it all over the top, and had yummy crunchy peanut topping to these wonderful brownies! Thanks for sharing yet another wonderful recipe Bryanna! BTW .... I did not have any oranges, hence no orange zest. I used 1/4 tsp. orange extract, and that worked fine. Great combo of flavors, Bryanna ... orange and chocolate! I didn't have orange zest, so I had to omit that. Even without it, the brownies were the best I've ever had!! I couldn't believe vegan brownies could taste so good. Thank you for this recipe!!! Can I use ground flaxmeal instead of flax seeds? Kristina-- yes, you can use flax meal, but, because ground flax has more volume than flaxseed, use 1 1/2 Tbsp. flax meal (ground flax seed). I'll add that to the recipe!